Martha King explains the risks of pilot fatigue and external pressures for private pilots. The view out the windscreen from 38,000 feet wasn’t really scary, but it was fatiguing. Nexrad confirmed what we were seeing. After our fuel stop in Wichita, Kansas, we would have to pick our way around air-mass thunderstorms in the dark all the way home to California. It had been a hardworking business trip to Washington, D.C., with multiple meetings every day. After the day’s late luncheon meeting, we loaded up our rental car and made the hour-long drive out to Manassas Regional Airport. It took us another 45 minutes to get the airplane loaded up, the rental car turned in, and say goodbye to the folks at the airport. Martha, Pilot in Command of the Dassault Falcon 10 jet . Approaching Wichita, John missed our clearance for descent from center. I picked up on it, answered center and started us down. “I’m sorry,” John apologized. “For some reason, I’m just whipped.” “Yeah, I’m really looking forward to getting home tonight,” I said. John’s words struck me. I now realized that this was at least the third time my copilot had told me he was tired, and up to that point, I had never considered doing anything about it. I had set a goal of getting home that evening, and I hadn’t considered any alternative. It may be the first time ever that we had interrupted a trip simply because we were tired, but it was the right choice. After we slowed down, I realized that I too was exhausted, but I had been driven on by adrenaline and my desire to get home. Neither one of us could have been operating at 100 percent. As it was, we finished the trip to San Diego the next morning, refreshed and alert with virtually no weather to contend with. Localized lightning and thunderstorms at night require absolute attention and respect. They represent an even greater risk when pilots are fatigued. John and I love flying our airplane for business. It gives us the ultimate in flexibility. We go when and where we want. But that flexibility can be a risk factor. Airline operations have elaborate precautions against fatigue. 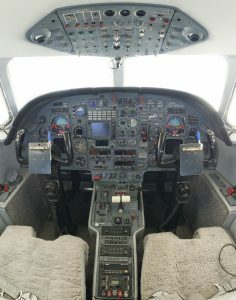 All flight crew members, schedulers and individuals with operational control in airline operations are required to receive fatigue education and awareness training annually. Complex rules adjust allowable flight times based on things like how far pilots are from their home time zones and what time of day they are starting their flights. As noncommercial operators flying our own airplane, there are no such systems in place to protect us from ourselves. There is nothing to prevent us from finishing a day of work or recreation and then departing on a long flight late in the day. It is strictly up to us to balance our fatigue against our desire to complete what we set out to do. In my case, I had set a goal to get home that night, but it wasn’t even a conscious goal. I hadn’t announced it to either myself or John. When I filed the flight plans for the day, as a matter of course I filed them for a trip all the way home. I never considered whether one or both of us were fatigued. Going home was my default position. Even though the goal hadn’t reached the level of consciousness, it was very real. It lurked behind every decision I made. It may be that while stated goals are dangerous, unarticulated goals are even more dangerous. When a goal is out in the open, it can be dealt with. But when nobody has stated the goal, it can influence you without you realizing it. 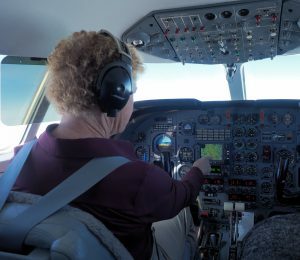 John and I use the PAVE memory aid to think and talk about the risk factors on a flight. In retrospect, I realized that on that flight, three out of four categories were at play. Pilot: We were both fatigued and had reason to know we would be. Aircraft: We had a perfectly functioning and capable aircraft that we were putting at risk. 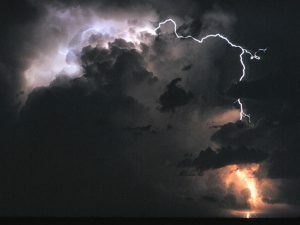 EnVironment: The next leg would be in the dark with thunderstorms. External/Internal Pressures: My unstated goal to get home that evening was a risk factor. Fatigue can be a vicious circle. Everything is harder when you are fatigued. It can be easier to just keep going because it’s too much work to come up with a different plan. When John brought up the possibility of spending the night in Wichita, one of the first thoughts that went through my mind was that it would be too much trouble to get over to a hotel and check in. Continuing seemed simpler. Since we don’t have protections against fatigue built into general aviation, we have to manage fatigue on our own. However, our innate flexibility gives us options that the airlines don’t have. To make wise use of that flexibility, we need to manage our own internal and external pressures. Our biggest threat is our own goal orientation — we pilots just hate to give up on a goal. Understanding this gives us permission to not complete what we had set out to do. I guess the most important part of being pilot in command is being in command of our goals. This entry was posted in Blog & Stories, Flying Magazine Articles, Martha King on October 12, 2016 by Pilot One. You guys write the most pertinent articles that us pilots can completely relate to and absorb. Thank you. Hello John and Martha, I am great full for this article and the many others you have done. So rich and full of information.. keep up the good work. I never miss the opportunity to read the experiences of the Kings. Indeed fatigue is a killer and we all must know how to contend with it. Sometimes we indulge and overdo our intentions in getting from A to B but sometimes a short stop to think can make a whole big difference. John disaligned the cheese… This made the whole scenario and mitigation more effective. All it took was less than a minute to change the destiny of who knows what could of occurred due to fatigue. Such a good reminder. It’s so easy to get caught up in the excitement of flying and the desire to push through to the next location. Glad to read stories like this that reinforce that caution is King. Probably the best Risk Management article ever written! Thank you! Good call! It’s always better to be on the ground wanting to be up there, than up there wanting to be down there. Great reflection and protective encouragement. Recall of a situation in Alaska when there was ice rain conditions throughout Southcentral Alaska. Our evening flight from Kodiak got redirected to Homer. Waiting on the ground with hopes that Anchorage would be soon clear it was determined that it is not getting better, we were all tired, and we were on the ground safe. The next mornings flight was quick, routine, and well rested.